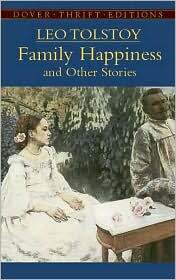 Family Happiness and Other Stories. Leo Tolstoy. I had tried to read War and Peace a few years ago, and didn’t make it much past 200 pages or so. But after seeing how high McCandless was on Tolstoy, I decided to give some of his short stories a try. This book has six stories — some short and some more like novellas — and all of them are pretty good, though I’d have to say I Master and Man caught my attention the most. 1. Family Happiness — the longest story in the book, and where the quote above is from. What is interesting is so much is lost without context, and in fact, this expressed desire is quite different from what the protagonist fins in the end. It is written when she is young and falling in love… Later in the story she finds “the end of romance of our marriage; the old feeling became a precious irrecoverable remembrance; but a new feeling of love for my children and the father of my children laid the foundation of a new life.” I can say that I disagree with what happened to the couple. The romance and love does not need to fade away. It takes work, and I know I am not always the best at it, but I will continue to try my best to keep it alive! Of course what she did find is valid too, and important. But the spark does not have to die! all of us, and especially you women, must have personal experience of all the nonsense of life, in order to get back to life itself; the evidence of other people is no good. … a quiet life in the country, with constant self-sacrifice, constant mutual love, and constant recognition in all things of the kind hand of Providence. … the only certain happiness in life is to live for others. …the proper object of life was happiness, and I promised myself much happiness ahead. 2. Three Deaths — Very bizarre! 3. The Three Hermits — This is just an old folk tale Tolstoy is re-telling. It was quite ironic. 🙂 A Priest tries to teach three hermits how to pray, and then they show him a thing or two! 4. The Devil — A pretty fascinating account of what can happen when you let something worldly, like lust, take over your life. Perhaps what was most interesting in this one is that it is presented with two endings, though neither is that good compared to the rest of the story, which was passionate and intriguing. …if Eugene Irtenev was mentally deranged when he committed this crime, then everyone is similarly insane. The most mentally deranged people are certainly those who see in others indications of insanity they do not notice in themselves. 6. Master and Man — This was probably my favorite, perhaps because it becomes an outdoor adventure caught in a bad snow storm, and I was once caught in such a storm. Overall, all of the stories were good, the translation very well done, and now I may someday attempt War and Peace again, or give Anna Karina a shot.